Duelling billboards? Yes, indeed, that's what Starz is going for—in a fun partnership with Captain Morgan—with this outdoor campaign in Los Angeles for its new Michael Bay-produced pirate show Black Sails, which managed to knock the top out of the network's original premiere ratings with 3.5 million viewers this weekend. The show has had a major presence in the geekosphere for half a year now. "I think it's the longest-lead campaign I've ever worked on," said Alison Hoffman, svp of original programming, marketing communication for Starz. "We were going to go to Comic Con San Diego, of course, and we decided to screen the entire first episode, and we had such overflow that we did it again." Hoffman adds: "You always want to extend your reach, and Captain Morgan was kind of a first choice for us. There's this survival, hustler, thieving quality for Black Sails, and there's more fun and adventure for the Captain Morgan brand, and that was when we realized that we probably shouldn't be holding hands; we should be at war." 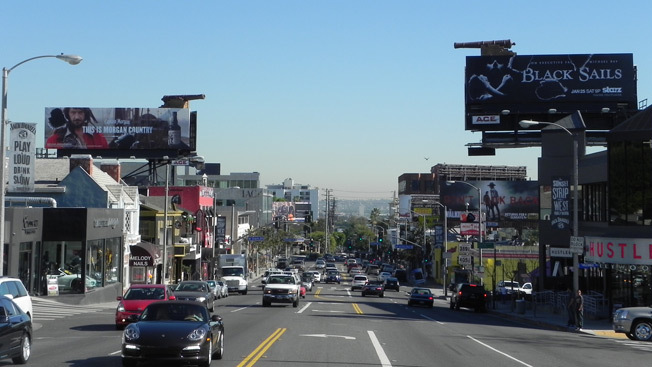 So at war they are, with duelling billboards across Sunset Boulevard, complete with cannons (and cannon holes). The campaign includes other out-of-home extravagances, notably some backlit, glowing bus ads. And while Hoffman said the network took a no-peglegs, no-eyepatches approach to the show proper, it has given in occasionally and celebrated Talk Like a Pirate Day, among other matey-related milestones. "It's gritty and real," says Hoffman, "but at the same time … it's pirates."